Boycott all you want. The duopoly is doing just fine. Google and Facebook's forecast-smashing first-quarter ad revenues suggest the duopoly is only going to grow as they diversify, despite brand-safety fears from advertisers. Google parent Alphabet posted ad revenues of $21.4 billion in the first three months of 2017, up 18 percent year on year. Meanwhile, Facebook reported ad revenues of $7.9 billion in the same period, up a staggering 51 percent from the first quarter of last year. "The ongoing issues around brand safety have had minimal impact on Google and Facebook because there is nowhere else for advertisers to go to find that scale and size in digital," Jitendra Waral, a senior research analyst at Bloomberg Intelligence, said. "But these fears could be delaying the exodus of TV ad dollars to video." Google and Facebook are too big to fail at present, according to Bill Fisher, a senior analyst at eMarketer. He said: "Our estimates put [Facebook’s] worldwide monthly active users at 1.44 billion and this is expected to reach 1.69 billion by 2020. When you have that many users, it’s difficult for advertisers to stay mad at you for too long." For Google, Fisher said a lot of its ad revenues derive from search and predicted: "We do see a plateau coming." He continued: "Search will account for 44.9 percent of total digital adspend this year, but that’s going to start falling to 44.4 percent next year and, the year after, 44.2 percent. "Google has diversified. It’s gone into video and display and, despite all the controversy, it has a huge user base. Brands are looking for audiences and video is going to be a big word. This is why we may not see a plateau of Google despite the pending plateau of search." Waral explained that the growth areas for Facebook are WhatsApp and Messenger but it has "yet to crack" how to monetise these platforms. He added: "Advertising market share should be steady for both [Google and Facebook] as integration of artificial intelligence techniques, coupled with control over data, means they would be able to provide better ROI longer term versus the competition." 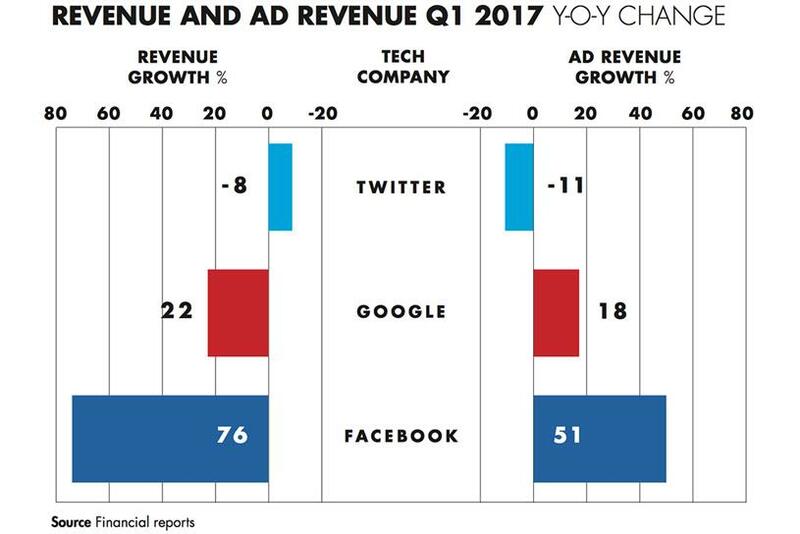 Although Twitter has avoided brand-safety concerns on the scale of Google and Facebook, it has not performed as strongly as its rivals in terms of ad revenues. In the first quarter, Twitter posted an 11 percent drop to $474 million. However, Waral and Fisher agree that Twitter’s video push may turn its prospects around. The platform announced earlier this month that it has signed 14 exclusive video content deals with Bloomberg, BuzzFeed and the NFL, among others. Emarketer projects slow but continued growth in Twitter’s active user base from 255.3 million this year to 275 million in 2020. Waral said: "Twitter is seeing momentum in daily active users with product improvements and are pivoting towards live video. This could help longer term, but we need a few quarters of evidence to validate the effectiveness of [these changes] in stemming revenue declines." Programmatic: Guilty until proven innocent?